Canagarajah, Suresh. Critical Academic Writing and Multilingual Students. Ann Arbor: The University of Michigan Press, 2005. C. notes that “critical” in academic writing means developing an attitude toward the hidden components of text construction (1). Criticality occurs when texts are situated in rich contexts and the practice of critical writing can open the self up to new orientations to the world. As C. notes, “By connecting the text to context (or the word to the world), the critical perspective enables us to appreciate the complexity of writing and address issues of literacy that have far-reaching social implications” (1-2). In short, C. claims these shifts are represented in one statement: “the shift is from writing as an object to writing as an activity” (6). C. writes this books for ESOL/ESL students, not EFL students. 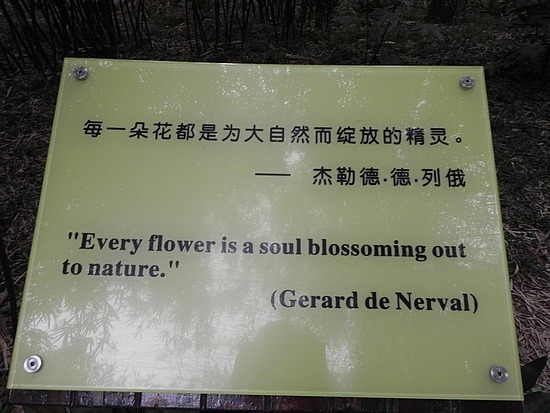 He differentiates by saying that EFL uses English as an auxiliary language for specialized purposes. ESL learners are often bilingual products of Empire, imperialism, etc. This division is harder and harder to maintain as English is becoming a global language. C. notes that hybridity doesn’t equal homogeneity and cautions against thinking that homogeneity is created through technological, capitalist, market forces and mass media. Rather, C. claims that “issues of power and difference have simply become more subtle and dispersed” (11). When considering critical writing, C. claims that what is actually important is that we consider attitudes toward differences (not difference itself)[1. Here we see the roots of the multilingualist/transnational composition position on practice: develop a “stance” or cultivate a particular way of approach in students . . .an attitude. Don’t worry so much with the practical day to day activities per se; rather, develop a way of being whose attitudes embody globalist epistemologies.]. This is especially important when considering multilingualist students – don’t view their language resources as deficiency but as resource (11-2). He calls this the “relativistic” orientation to writing. It differs from the “normative” approach because it doesn’t take L1 writing as the baseline. Difference-as-Deficit and Difference-as-Estrangement are set in contradistinction to C.’s preferred Difference-as-Resource prospective (13). C. claims that by valuing academic texts and discourses of multilingual students we can begin to reshape the discourse of the academy in productive ways (and vice-versa). He calls this movement “bilateral” (14). C. discusses the “crossing” model when teaching multilingual writers. This approach asks teachers to “attempt to build bridges to help multilingual students move from their local literacy practices and cultural frames toward academic/English discourses (and vice versa). . . . students are asked to adopt different roles and identities as they move between home and school [and] they have to remember that in each context there are different values, knowledge, discourses, and styles” (14-5)[2. This sounds an awful lot like being “rhetorical” in the conventional sense.]. This approach is problematic because it asks multilinguals to develop a split subjectivity that continues to reify the difference between home and the academy. As a fix, C. recommends the “negotiation” model wherein students “wrestle with the divergent discourses they face in writing to creatively work out alternate discourses and literacies that represent better their values and interests” (15). The negotiation model is a modification of the crossing model that adds a level of criticality to the discourse and allows for a mutual reframing of academic/non-academic for political/cultural reasons. C. considers the “separatist” position that claims that scholars from third world shouldn’t ever write in English (think Ngugi et al). This claims that the imperialist/colonialist residues found in English actually prevent it from ever being used without the reproduction of Eurocentric value. The universalists stand in opposition because they argue that language is simply a neutral conveyor of meaning. C. looks for a middle way by highlighting how pidgins and other modifications of English allow it to function for the people who use it. . . it is a resource against empire. In this way, C. claims that the negotiation model allows students to repurpose English for their own ends and use it to better represent the interests of their communities . . . but only if used critically. What will C. take up in this work? 1) Students should question the rules of any rhetorical situation: How did these rules come into being? Whom do these rules favor? What possibilities and limitations do these rules pose for critical expression? What alternatives are available? ; 2) critical writing involves interrogating received knowledge and reconstructing it through the writing process. . . knowledge is “interested” and contains values – multilinguals should be encouraged to critically engage knowledge in order to put it into conversation with their local contexts; 3) critical writing should encourage individual engagement and investment in writing. . . as such, writing should be a place to explore individual identity, consciousness, and values; 4) critical writing takes up the dominant conception of reality and attempts to modify it toward more democratic possibilities; 5) critical writing considers how language functions to suppress difference and reify its own values. All of these are important for all students; however, these are especially important for multilinguals as they bring “with them identities, values, and discourses from multiple communities” . . . their discursive resources may contain “alternative ways in which knowledge and society can be reconstructed” (21). In this chapter C. takes up the field of ESOL in order to understand what pedagogical assumptions, values and practices are dominant. He does this as a step toward building/shaping these pedagogical commonplaces toward a critical pedagogy. C. begins by noting that often ESOL teachers are treated like 2nd class citizens of an English department. . . particularly good at grammar but lacking theoretical or research competence (24). This ends up in a product, not process, oriented pedagogy that often ignores the rhetorical in favor of the formal. C. notes that the ESOL classroom is actually one of the richest political scenes at the university because it is often filled with economically underprivileged, extraordinarily diverse groups with colonial/imperial experiences and legacies (26). To remedy the problem of ESOL teacher marginalization, C. recommends two changes: 1) a greater emphasis on interdiciplinarity between ESOL, L1 comp, and other social sciences; and 2) ESOL teachers should become researchers, not just teachers (institutional constraints?). Four foci of L2 writing classrooms: form (product), writer (process), content (disciplinary writing), and reader (similar to the content pedagogy but with a more process orientation towards knowledge production) (Raimes, C. 30). Form: normative approach that ignores rhetorical differences of multilingual students in the interest of structural adherence. Results in formulaic, mechanical writing that encourages non-critical thinking. Writer: while well-suited to understand multilingual writers, the emphasis on cognition often cuts off the possibilities of the social aspects of writing. Too introspective/expressivist. This espouses an interaction ideology that sees power as being seized out of interactions between writer and world (the coming to voice narrative). Content: an emphasis on audience is great but the acceptance of academic knowledge as all-powerful goes unproblematized. Reader: Closest to understanding ESOL writers because it isn’t prescriptive, acknowledges the social aspects of writing, challenges the writer to make new knowledge in the face of knowledge they disagree with and values audience. Limited by the idea that a disciplinary body of knowledge is somehow democratic and changeable instead of ideological and domineering (38). C. starts by acknowledging that many composition teachers don’t teach grammar because conventional wisdom says that form will follow the development of great ideas in writing. 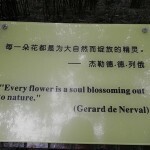 In other words, grammar will be “discovered” (46). C. argues this is a bad idea because form shapes content and grammar/form are ideological and, hence, sites for critical engagement (46). Chapter overview: 1) critique current research on grammar treatment in the writing process; 2) reconsider place of functional grammar in text structure; 3) discuss the influential research by the school of contrastive rhetoric, genre analysis (GA brings the study of linguistic/cultural differences a sophisticated research orientation by explicating the genres of writing in a variety of academic and professional contexts); 4) show how the insights of CR and GA can be tapped to help students appropriate structural patterns and achieve their critical purposes (48). C. notes that when teachers spend time trying to discover why students use a peculiar grammatical structure the teacher is actually assisting the student in serious considerations of their own language usage (55). C. recognizes that grammar use for strategic purposes is situational and, as such, each communicative context wherein grammar is modified for political/vernacular/critical effect must be considered in rhetorical context. As he notes, “This doesn’t mean students are free to use their vernacular versions for all contexts of communication” (56). Pedagogically, C. recommends that teachers identify common errors, assess whether their use is strategic or error, and spend time with students individually to understand why they are using the grammatical constructions like they use them. Problem with contrastive rhetoric: it represents cultures in a monolithic and discrete way (64). Cultures are actually quite often hybrids and defining “native” becomes particularly difficult to do. This is also the case when we consider texts. Contrastive rhetorics are incapable of accounting for the multivocality of texts and textual structures. . . especially when composed by students of multilingual backgrounds (65). C. uses the end of this chapter to demonstrate how a multilingual writer fashioned a single piece of writing for different RA forums: a Tamil academic journal, a local English academic journal, and a Western English journal. He compares introductions and conclusions of the texts to analyze how the thesis is foregrounded (77). He claims that what is interesting is “the transformations in these three texts as the writer shuttles between discourses and contexts” (77). C. finds that the writer shifts registers and formal moves for the different RA forums. He also highlights that the rhetorical patterns for the articles aren’t the same; rather, the audience and rhetorical pressures of different audiences effect the textual form in different ways yielding different rhetorical moves. 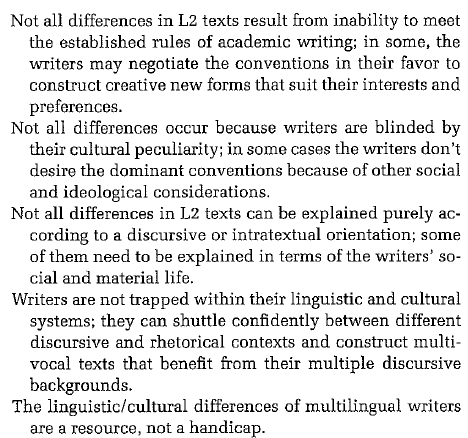 C. notes that the shuttling between different texts, languages, and cultures in these three essays should be considered a discursive resource, not a handicap. As such, “as we begin to grant agency to multilingual writers, we must become sensitive to the different strategies used by students to negotiate the essay form in terms of their values and interests” (79). This chapter takes up the cognitive/psychological aspects of writing before critiquing that position with critical considerations of materiality and the social/cultural influence on writing. In other words, C. wants to “contextualize cognition” in the writing process (90). C. problematizes expressivist approaches to writing by drawing attention to the “I” as Western construct of authorial, Romantic independent writer. 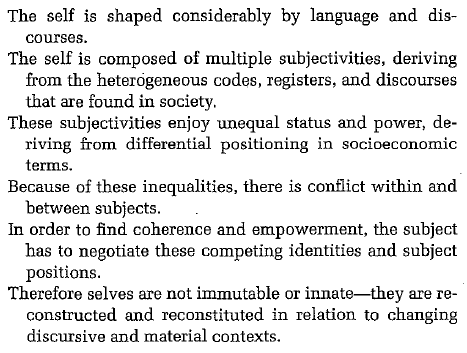 Further, because academic writing isn’t about the self (Ulla Connor), expressivist pedagogies aren’t the best for the academy. Further, C. draws attention to how different cultural differences actually make the carrying out of “process” models of peer feedback, critique, etc. very difficult to carry out (92). Materiality also complicates expressivist/process approaches because the kinds of material resources that facilitate writing (word processors, free time, paper, libraries, etc.) are often hard to come by in many areas of the world (95). This is the disembodiment of writing (103), a position that C. wants to critique because it assumes a transcendental consciousness and unified self that is abstract and idealized. C. identifies three strategies that multilingual writers use to negotiate the subjective conflicts they face when composing (113): 1) Avoidance – this is a strategy that refuses to engage with the conflicting identities of the writer; 2) Accommodation – this strategy occurs when a writer restrains their L1 identity in favor of adopting voice and identity of L2; 3) Transposition – this strategy adopts a dialectical voice that defines itself against the conflicting discourses. Each of these strategies is useful for its own purposes and contexts. . . as such, one isn’t inherently better than the other. They are just different. As C. notes, “Complexity in voice is achieved by working with and working against the competing discourses to achieve an empowered selfhood” (118). C. begins by noting that knowledge isn’t simply inside the writer’s head (as in the expressivist position); rather, it is rhetorically and socially constructed (127). 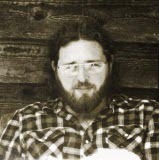 The Content approach looks to recognize the situated nature of knowledge in order to better prepare the writer to meet the needs of the discourse communities/disciplines who traffic in said knowledge; however, this pedagogy doesn’t do much to critique the authority of said disciplinary knowledge. C. notes that knowledge is: 1) contingent – a product of a particular rhetorical/political/cultural context; 2) personal – against empiricism, this position argues that knowledge is subjective and effected by our social position, geolocation, and past experiences; 3) rhetorical – knowledge is fluid and changing, always subject to the rhetorical efficacy of “reporting” (Latour & Woolgar). In other words, knowledge gets constructed and reconstructed all the time; 4) social – knowledge is communally sanctioned by particular discourse communities/disciplines; 5) constructed – knowledge is put together by people through rhetoric in texts as discourses (a challenge to positivism); and 6) contested – knowledge is the subject of conflict and contestation because particular interests are served by knowledge production and ownership. As such, dominant groups contest challenges from other forms of knowledge and tend toward discouraging marginalized groups from claiming space (using the same methods) for their own knowledges (126-9). EAP is an example of a sub/discipline that encourages a content approach but doesn’t question the hegemony of the knowledge that it teaches writing in/through. Because of its pragmatic orientation, EAP discourages critiquing the constitution of knowledge in favor of teaching knowledge use in specific disciplines for successful rhetorical performance. As C. notes, the danger is that multilingual writers can internalize the knowledge paradigms of the Center and exert their hegemony over the discourse communities’ knowledges that they come from. 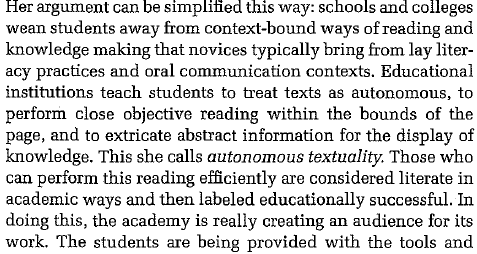 C. acknowledges that engaging with a lot of written texts through reading allows students to get a better idea of how knowledges are constructed in the academy (143). In this way, reading is a “socialization” into disciplinarity and particular discourse community epistemes. In contradistinction to autonomous textuality, advanced students at the university are encouraged to do “rhetorical process” reading – reading that is closer to their original ways of reading before disciplining and reading that encourages an investigation into the rhetorical construction of text in order to see how knowledge is relative, constructed, subjective, and discursive (146). C. recommends that we break the faith of students in autonomous textuality. Further, we must question content-pedagogies by pushing students toward the domains of knowledge construction. cultural practices: knowledge could be collectively owned in some cultures (oral especially), memorization is valued in some cultures, the self is part of the community and the development of individual ethos is seen as a cultural taboo, ownership of knowledge/words is often difficult in totalitarian political cultures. educational practices: some cultures encourage quoting without interpretation as a sign of respect, education is often an enculturation mechanism that seeks to have a student operate successfully using “communal wisdom” (without citation). rhetorical traditions: some cultures encourage use of classical/religious/philosophical texts. the process of originality is created through dialogue with the words of others. 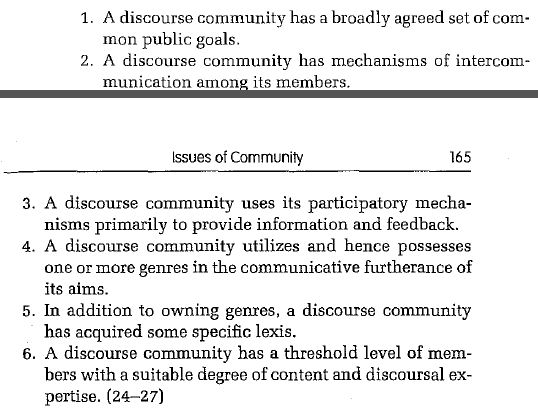 C. begins by acknowledging that different aspects of audience/community influence every single part of textual construction – knowledge, conventions, genre, and register as well as invention, drafting, revising, etc. are all touched by community. This is an extension of the social ontology into epistemology and writing. Chapter plan: 1) recognize the role of discourse communities in the construction of knowledge; 2) using a critical perspective, understand the conflicts students negotiate when accessing and being accepted into an academic community; and 3) consider how the writing classroom can be a space where “meaningful interactions” between student, peers, and faculty can assist students into the “ways and words of the academy” (162). 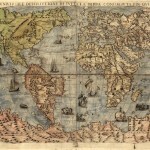 For discussion of discourse communities see the Geopolitics entry. Why might ESOL students have a hard time being worked into a DC of academic discipline? 1) they aren’t insiders to the DC of the West; 2) they may bring negative attitudes toward the academy b/c of the Western academic trend to colonize and sometimes denigrate local knowledges; 3) gaining insider status as an outsider in the academy is difficult because material resources are at stake – ESOL must adopt “discourse strategies” of conflict and negotiation to try and temper this exclusion; 4) ESOL students might have conflicts considering their own alliances; and 5) ESOL students can become ideologically indoctrinated into the systems of knowledge and power of the Center and end up marginalizing their own native communities (167-70). C. again notes that Pratt’s contact zones are a pedagogical critical perspective that allows students to “adopt creative strategies to fuse their interests and values into the academic conventions” (173). C. provides an example of what this might look like on 175. This is writing as a process of socialization. For C., the safe house is a site that practices “engagement with competing discourses and languages [that] enables implicit comparisons between vernacular and academic discourses that help [students] develop a metadiscursive awareness” (187). In other words, students can find the tools to recognize their shuttling between discourses in these sites. The DC orientation actually encourages students to move into the processes of knowledge production – not replication or reproduction (207). C. notes that “multilingual students must realize that the effective way to become insiders in a DC is to enter the ongoing discourse and conversation in a relevant but critical manner where their contribution is valued” (207). In this chapter C., considers the changes in communication technologies and writing technologies and how these changes have changed the nature of what it means to be “literate” in today’s world. Further, he argues that these changes necessitate a revision in teaching writing. C. notes that the use of new media by different communities will differ a lot because the thought processes and styles of communication vary so much (221). The ideology of the software itself often presents a problem for multilinguals or non-Western speakers because they fail to “manipulate the multidirectional spatio-temporal possibilities of new media” (221). As such, C. notes that because new media infrastructure/literacy is controlled by a select group then the medium does effect the message (222).